I also got RC9 OTA last night/this morning and can't get latitute to work. also missing is voice search. Have you noticed how the update says its ( RC9-from-TMUK-RC8 ) does this make any sense? And why? 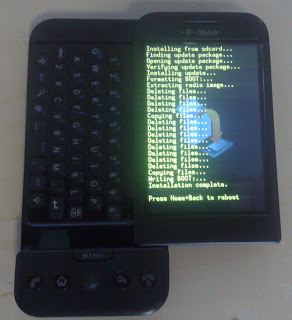 Adonis, just because it is a patch update from T-Mobile UK RC8 to RC9, not a complete firmware flash. Hey GeekYouUp, I got my update earlier this morning at 9:30, haven't used Google Maps as of yet - only got my G1 on Sunday! It looks like latitude has been disabled. The Google Maps seems to be the right version but no latitude. With the introduction of "Check for New Updates" in the settings I am wondering if T-Mobile UK are planning more frequent updates similar to the US. Fingers crossed!